Update: December, 2014: Cór Ainglí is taking a break from performing in 2014. To be kept abreast of our plans for 2015, please visit our Facebook page. If you'd like to keep up with what Mary Mc Laughlin is doing currently, please visit her web page. If you have specific questions, you can contact us at info@coraingli.com. UPDATE: March, 2013: Since the article below was published in 2011, there have been a few changes at Cór Ainglí. Originally formed as a 20+-voice, community-based Christmas choir, the Cór has expanded its repertoire to include music from throughout the entire year, as well as sacred songs from pre-Christian Ireland and songs from the Irish fairy tradition. It's also contracted in size, becoming an incredibly tight, nine-voice ensemble that's able to perform in a wider variety of venues and with a sound that better reflects what Mary envisions when she arranges for her CDs. Also, since then Mary's released another wonderful solo CD: Sacred Days, Mythic Ways, which includes a lot of the music she sings in concert with Cór Ainglí. We've even had our theater debut, performing as the chorus for Sharon Took-Zozaya's beautiful and evocative dance production "Selkie Tides," which played throughout the Monterey Bay Area in 2011, as well as at the 2012 Santa Cruz Fringe Festival. Some things never change, however! We're still a truly diverse bunch, and we still love bringing this unique and wonderful music to you! The article below tells you how we got our start. Our future is yet to be written. An earlier version of this article originally appeared on the popular Irish music blog site Irish Music Forever in May, 2011. Galway? Derry? No. 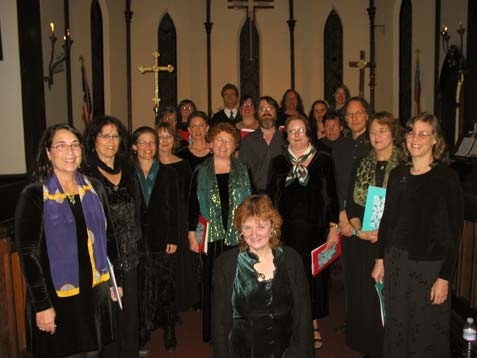 This was the first public performance of Mary Mc Laughlin’s Cór Ainglí, North America’s only dedicated Irish Gaelic Christmas choir, based in Santa Cruz, California. And, despite very “un-California-like” weather, the group actually sold out not one but two venues that weekend in 2006. “Irish,”sometimes referred to as “Irish Gaelic” in English (or, in Irish, An Ghaeilge), is a member of Celtic family of languages that also includes Scottish Gaelic, Manx, Welsh, Cornish, and Breton. Once spoken by the majority of people in Ireland, (and still the first official language of the Republic of Ireland, as well as the day-to-day language for many people living in the Gaeltachtaí, or Irish-speaking regions), Irish was nearly eradicated by centuries of war, oppression, famine, and emigration. It has undergone a resurgence in recent years, with a television station; several radio stations, newspapers, and magazines; Irish-medium schools; and even a social networking site dedicated to the language. Cór Ainglí (“Angelic Choir” in Irish, from the first line of the Irish version of the carol “Angels We Have Heard on High”) is the creation of renowned Irish singer, songwriter, and teacher Mary Mc Laughlin. Mary fell in love with traditional Irish singing as a young girl, growing up in her hometown of Omagh, County Tyrone, and attending Irish-language summer schools in the Donegal Gaeltacht. Although traditional Irish sean-nós (“old style”) singing is typically performed solo (and even when sung in a group setting, is rarely harmonized), Mary could always “hear” the harmonies lurking behind the melodies. When Mary records her CDs, she layers the vocal tracks, so her own voice provides both melody and harmony. When she began to plan her “Gaelic Christmas” CD, however, she decided to form her own SATB choir, so that the choral arrangements she was writing (and recording for the CD using her track-layering technique) could also be performed live. One thing that is unique about Cór Ainglí (other than the fact that they sing in a language not often heard outside of Ireland) is that many of the singers don’t read music. Looking for people with an interest in singing in Irish, Mary drew heavily from those steeped in folk traditions, where music reading isn’t always a necessary (or even a desired) skill. Although sheet music is supplied for those who do read, the parts are largely taught by rote and reinforced by practice CDs that every choir member receives. Mary makes a point of telling prospective members that they don’t need to be able to read music to sing in the choir…the important thing is the ability to carry a part and to blend. That said, this choir sets a very high bar, and members are expected to spend a great deal of time practicing on their own, as well as attend weekly rehearsals. Another interesting facet of Cór Ainglí is that, although it is a Christmas choir, performing largely sacred music, the members (and the audiences) come from a wide variety of belief traditions, drawn together by the opportunity to sing and enjoy this beautiful music and ancient language. Members come from all over the Bay Area, some traveling close to 50 miles for weekly rehearsals! The choir’s repertoire consists of a mixture of traditional Irish carols -- many of which are unfamiliar to American audiences -- and more familiar European and American carols that have been translated into Irish. In recent years, Mary has also added some 13th century Latin chants to the mix, a legacy of her Masters Degree in Gregorian Chant and Sacred Irish Music at the internationally acclaimed Irish World Music Academy at Limerick University. Some of the works are performed by the full choir, while others are performed by small ensembles or by Mary as a soloist with the choir’s backing. Instrumentation typically includes harp, guitar, fiddle and/or flute, and a variety of percussion instruments, though some pieces are performed a cappella or with piano accompaniment. A guest act (which in the past has included women’s vocal ensemble Zambra and Mary’s Celtic-Americana Band Camogie, among others) provides additional variety, as well as an “ear break” from the flow of Irish. For the past few years Katie Loveless has taken on the role of conductor allowing Mary to focus on soloing and presenting the concerts. Christmas: It’s not just for December! For the rest of the world, Christmas is something that happens in December, but putting on this kind of show is a year-long job. Cór Ainglí typically gives between two and four performances between Thanksgiving and Christmas, but preparation begins long before. In fact, arranging for the next year’s performance venues and for accompanying instrumentalists starts almost immediately after Christmas, and recruitment for prospective new members begins in March. In the intervening months, Mary works on acquiring, arranging, and translating new material. A workshop and group audition for prospective members is held in late May or early June, and mandatory weekly workshops for all choir members, new and returning, continue through July. The choir itself takes a brief rehearsal break in late summer (during which individuals are expected to practice on their own, using the extensive materials they’re given during the summer workshops), but that’s also when the promotional effort gets started, going into full swing late in September. Weekly rehearsals begin again in the fall, and continue up to the date of the first performance. In the early years, Cór Ainglí’s main Santa Cruz performance and rehearsal venue was the lovely gas-lit Victorian sanctuary of Calvary Episcopal Church, in the heart of the city’s downtown area. Historic Calvary Episcopal Church in downtown Santa Cruz was Cór Ainglí's first venue. After the second year, however, it became clear that the concerts were more popular than the small historic church could handle, and the Santa Cruz performance was moved to 400-seat Holy Cross Catholic Church – a city landmark that sits on a hill above the downtown area and is renowned for its beautiful interior and excellent acoustics. Holy Cross Catholic Church, perched on a hill above downtown Santa Cruz, is a well-known local landmark. Cór Ainglí performing at Holy Cross, 2009. The church's beautiful interior and fine acoustics are a perfect foil for the music. The choir also performs in the Silicon Valley and San Francisco Bay areas (past venues have included churches in San Jose and Morgan Hill, and even a mausoleum in Oakland!). A year after the move to Holy Cross, the rehearsal site was also moved, to St. Andrew Presbyterian Church in the town of Aptos, just south of Santa Cruz, making commuting a little easier for choir members from other areas. In 2007, Mary accepted an invitation to form a second Cór Ainglí in St. Louis, Missouri, which also performed to sell-out crowds. And in 2009, Community Television of Santa Cruz recorded the California group’s Holy Cross performance and broadcast it throughout the Christmas season. Clearly, choral music in Irish is something America is willing to embrace…stormy weather or not!